Sign up at janice@wildsouth.org or 256-974-6166. Advance registration is required. All ages welcome! 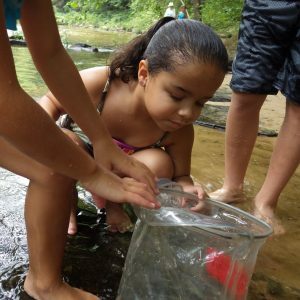 This hike is open to groups and families that include children and teenagers under 18 years of age. Accompaniment by an adult 18 or over is required. 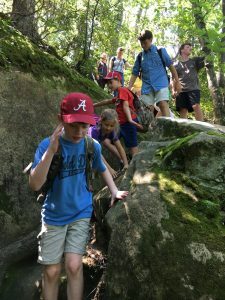 Wild South’s Wild Wednesday hikes are for families to explore together and learn about amazing places on our public lands. After departing the Wild South office in Moulton, we will travel about 35 minutes to the western part of the Bankhead National Forest to the Kinlock Historic District. 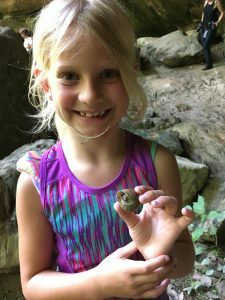 From there, we will hike half a mile to Kinlock Shelter, a culturally significant sandstone shelter that was used by Native Americans and is still an important sacred site. Upon return to our vehicles, we will drive down the hill to Hubbard Creek and explore the area around Kinlock Falls, which is where we will have our lunch. Wear comfortable clothing for hiking that is appropriate for the weather. Footwear should be sturdy, protective, with good tread for slippery rocks and mud and can get wet. No Crocs or flip flops. Dogs are not allowed on this hike. After signing up, meet the group at the Wild South office (see address and map link above) at 9:30 a.m.